Overview - Robert Axle, an eccentric inventor turned ego maniacal infomercial guru, loses it all when one of his inventions maims thousands of customers. After 8 years in maximum security prison, Axle is ready to redeem his name and rebuild his billion dollar empire. But first he must convince his estranged 22 year old daughter to let him live with her and her quirky, over protective roommates. I often wonder what draws particular acting talent to certain projects. A smart script, interesting director, meaty role, enticing ensemble, or even a simple paycheck can all be alluring features to any thespian. In the case of 'Father of Invention,' however, none of these factors really seem to come into play. The script is simplistic, the direction is pedestrian, the main character isn't very compelling, the ensemble is eclectic but not particularly impressive, and with a relatively low budget, I doubt the paycheck was all that substantial. So, again, this just leaves me wondering what someone like Kevin Spacey saw in such a project that led him to not only star in, but also produce the film. I mean, it certainly isn't a horrible movie, but it is formulaic, forgettable, and just plain unengaging. So, what was it, Mr. Spacey? What made this movie jump to the top of your to-do list? What was it about the project that made it seem so appealing? Was it the fact that you got to grow a weird, scraggly beard? After all, you did seem to enjoy that beard quite a bit, but is that really enough of a reason to make a film? Actually, now that I think about it, that beard might not even have been real. Could a movie get green-lit based solely on the allure of a creepy, potentially fake beard? Well, it would appear that the answer is... yes. 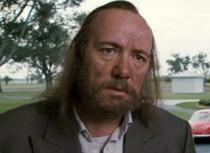 So, for now I'm simply going to have to assume that 'Father of Invention' exists for the sole purpose of facilitating Kevin Spacey's desire to grow and/or paste on a weird, scraggly, and possibly fake beard. Seems pretty reasonable to me. The story focuses on Robert Axle (Kevin Spacey) a successful infomercial entrepreneur who is sent to prison after one of his products (or "fabrications," as they're called in the film) ends up chopping people's fingers off. After eight years of incarceration, Axle is released (now sporting the aforementioned scraggly beard) and attempts to reconcile with his estranged daughter (Camilla Belle) and reclaim his lost empire. Now with a new perspective on his life and past transgressions, he must decide whether to turn over a new leaf, or repeat the same selfish mistakes. The movie attempts to be a quirky comedy of sorts, but unfortunately, the humor mostly falls flat. Early clips of Axle's actual infomercials carry a slight satirical quality but end up clashing with the rest of the story's more realistic tone. Watching the former billionaire readjust to life on the bottom has some humorous potential, and there are indeed some slightly amusing gags that involve the character's increasingly bad luck. The problem is that the script simply lacks creativity and substantial wit, and very few of the jokes or occasional slapstick antics end up working. Spacey does a decent job in the role but the material just isn't very compelling. The rest of the odd ensemble is made up of solid actors and comedians like Craig Robinson, Virginia Madsen, Heather Graham, and Jonny Knoxville (yeah, I think he's a fairly good performer), it's just a shame that none of them are given anything interesting to do. In fact, even though these are all reliable actors, a lot of the performances come across as flat and artificial (Belle, in particular) and this seems to stem from a mediocre script and poor direction. Attempts at heartfelt drama are made through Axle's relationship with his daughter, but the film's emotional observations are clichéd and unoriginal. Flashbacks to Spacey's character before his imprisonment feel forced and clumsy, and the overall plot is incredibly by-the-numbers and almost insultingly predictable. While I don't want to give too much away for the sake of any that might be interested in seeing the movie, the climax involves a scenario that we have all seen countless times before, with someone giving an emotional confession in public in front of a large audience, essentially spelling out everything that they have learned throughout the running time. The plot doesn't bring anything new to the table, and nothing about the execution is interesting. It's all derivative, awkward, and just plain forgettable. While I come across many mediocre movies, I can often at least say that they hold some entertainment value. Unfortunately, though, there isn't much amusement to be found here. I don't want to be too hard on the film because I do feel that its heart is in the right place, but there just isn't enough talent behind the camera to elevate the material into anything worthwhile. With a formulaic script and simplistic direction, 'Father of Invention' lacks laughs and creativity. If you're a big fan of scraggly beards there might be some appeal here, but for most this is likely an easy pass. Anchor Bay brings 'Father of Invention' to Blu-ray on a BD-25 disc housed in a standard case. After some skippable trailers the disc transitions to a standard menu. The packaging indicates that the release is region A compatible. The movie is provided with a 1080p/AVC MPEG-4 transfer in the 2.40:1 aspect ratio. With some nicely saturated colors and pleasing dimension, this is a strong video presentation. The print is in pristine shape with a light layer of grain. Clarity is very good with lots of small, fine details visible (you can make out every strand of Spacey's scraggly beard) and many scenes exhibit an excellent sense of depth. The color palette is bright and vibrant, offering nice pop without appearing over-saturated or unnatural. Contrast levels are high without becoming overexposed and black levels remain nice and deep throughout. Compression artifacts or other anomalies are thankfully absent. The cinematography itself is nothing special, and the visual style remains rather basic, but the technical presentation provides great detail and vivid colors. Free of any unnecessary processing, the transfer sparkles with a sharp and rich sheen. The audio is presented in an English Dolby TrueHD 5.1 mix with optional English SDH and Spanish subtitles. Unfortunately, though the track gets the job done just fine it lacks any real semblance of immersion or excitement. Speech is clean and carries a nice, full quality. With that said, there are a few instances where some background noise is audible in the mix. Directionality across the front soundstage is OK but negligible, and surround use is disappointingly sparse. Outside of some faint music cues and minimal ambiance, rear activity is absent and the soundscape as a whole feels very small and underdeveloped. Dynamic range is adequate with no notable distortion. Bass response is subdued but there is some occasional low frequency presence in the film's soundtrack. Balance between all of the auditory elements is good. 'Father of Invention' sounds decent yet unremarkable. The content itself doesn't call for an especially bombastic or enveloping mix, but this track comes across as fairly lifeless. The Making of Father of Invention (SD, 14 min) - Presented with Dolby Digital 2.0 sound and no subtitle options, this is a basic and fluffy behind-the-scenes promotional piece with cast and crew interviews and some on-set footage. The participants spend most of the time complimenting each other while offering basic observations about the movie's themes, characters, and plot. This is a pretty useless featurette, and the director tends to speak rather highly of his own movie, even going so far as to compare the film to the works of Billy Wilder, which only really serves to make it seem that much worse. 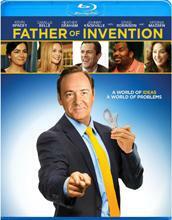 'Father of Invention' is a predictable and unoriginal effort that fails to capitalize on the talent of its lead. Though the filmmaker's intentions are earnest enough, the comedy falls flat and the drama is banal and unoriginal. On the technical side, video quality is excellent but the audio mix is unremarkable. Special features are limited to a brief and useless featurette. It's pretty safe to say that for most this is one to skip.